ISLAMABAD, Pakistan (CNN) -- A fire broke out at a major international hotel in Pakistan's capital Islamabad Thursday, five months after it was hit by a deadly suicide bombing. 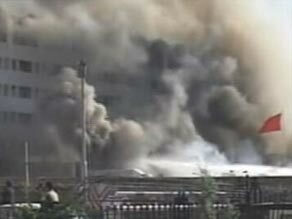 Smoke pours from the Marriott Hotel in Islamabad. Smoke could be seen pouring from the upscale Marriott Hotel, close to the country's presidential palace. Reports said five people were evacuated with injuries following the blaze, which came two months after the hotel was reopened following repairs to the bomb damage. The suicide bombing at the hotel in September 2008 left 57 people dead in what officials called the biggest attack in the country in seven years. Reports said Thursday's fire broke out on the second floor of the building where repair work was underway. The hotel is now surrounded by a large bomb-proof wall and extra security has been put in place to prevent further attacks.